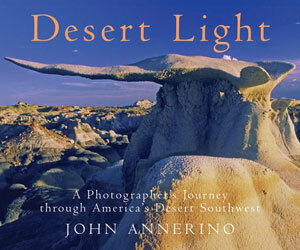 John Annerino, renowned photographer and author of America's Southwest and Old Mexico, risked life and limb to venture on foot into the most remote, abandoned, and chillingly silent tracts of the Painted, Sonoran, Mojave, and Chihuahuan deserts on both sides of the U.S. and Mexican border. His quest: to capture desert light from the highest summits, the starkest deserts, and the deepest canyons; and to convey the primal beauty of these impossibly rugged, uninhabited landsthese despobladosin evocative essays and hauntingphotographs. Regarded long-ago by ruthless Spanish conquistadors and gold-seeking settlers as Terra Incugnita, this region remains largely the same as it was while inhabited by indigenous peoples, who viewed its luminous landscape through a very different lens. To them, the beautiful sierras and captivating stone hoodoos were sacred and familiar, and revered for their omniscient majesty. Annerino uncannily portrays this awe-striking, sublime landscape through both sets of eyes in Desert Light. Full-color throughout.